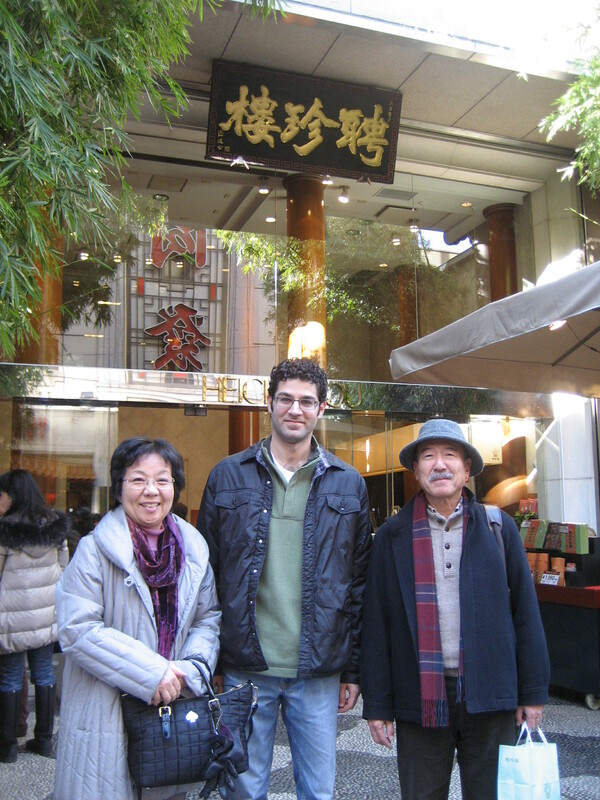 If memory serves me correct, there is a Chinese restaurant in Yokohama’s Chinatown that is not only the oldest Chinese restaurant in Japan, but also one of the most respected Chinese restaurants in the world. I first heard of HeiChinRou when watching Iron Chef years ago. The restaurant sent its top two deputy chef’s up against Iron Chef Chen Kenechi only to have him cut them down. Not satisfied, they finally sent their Grand Master Chef to set things straight, Xie Huaxian. Xie is considered by many to be the greatest Chinese chef of our time. He was victorious. Ever since then I told my self, “I have got to eat at that restaurant!” After 7 trips to Japan, including numerous time walking past HeiChinRou, that day had finally come. Yuki had plans with a bunch of her friends to show off Otis, so her parents took me to fulfill my belly’s destiny. An elegant restaurant on numerous floors, there’s a peaceful bamboo garden when you walk in. They took us in an elevator up to the second floor and sat us in a very comfortable booth. Coming from Chicago I was pleasantly surprised by how absolutely clean the restaurant is. It had the look and feel of a high-end French restaurant, not the greasy Chinese stir-fry I am used to. The menu features many a la carte dishes as well as a handful of set course options. Being the first week of 2012 we opted for the “Happy New Year” course option. 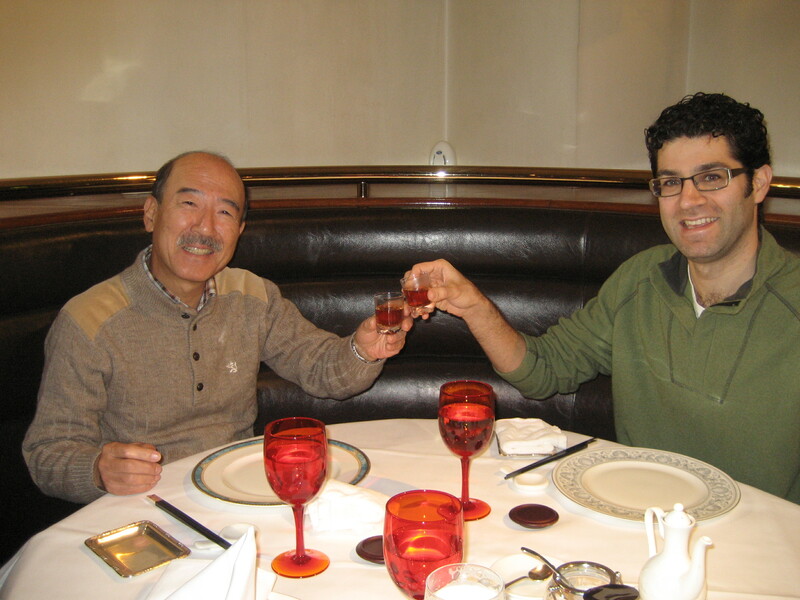 Uichiro and I started off with some Shokoshu, a type of Chinese rice wine or Shaoxing. Served warm, it has a caramel color as well as taste more similar to a Brandy than a rice wine. Very smooth and very warm in the belly, its delicious on a chilly day. The first course consisted of 5 tastes. 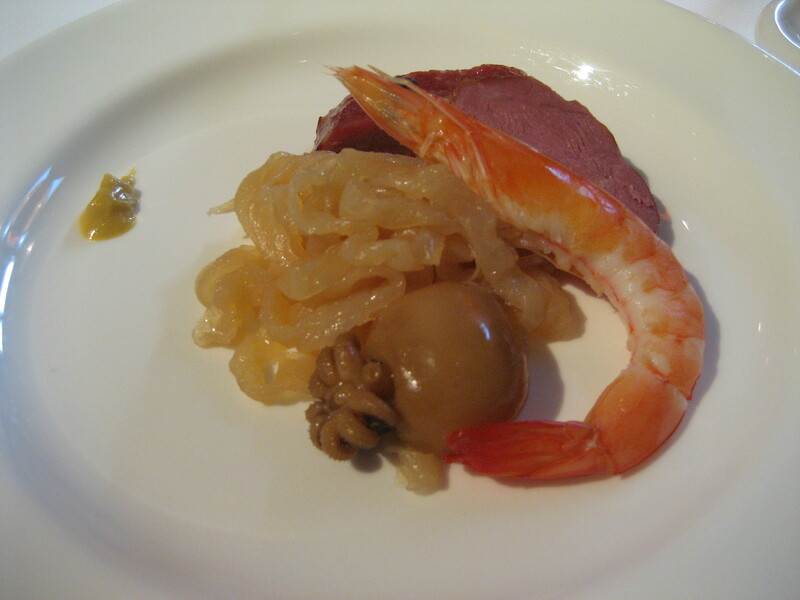 Jellyfish, a baby squid stewed in soy sauce, a shrimp, a slice of smoked duck breast, a piece of Chinese BBQ pork, and a dollop of mustard. While they were all fantastic, I have to say that the pork may have been the best piece of swine that has ever graced my palette! If it were socially acceptable I would drape myself in it and nibble on it all day long. 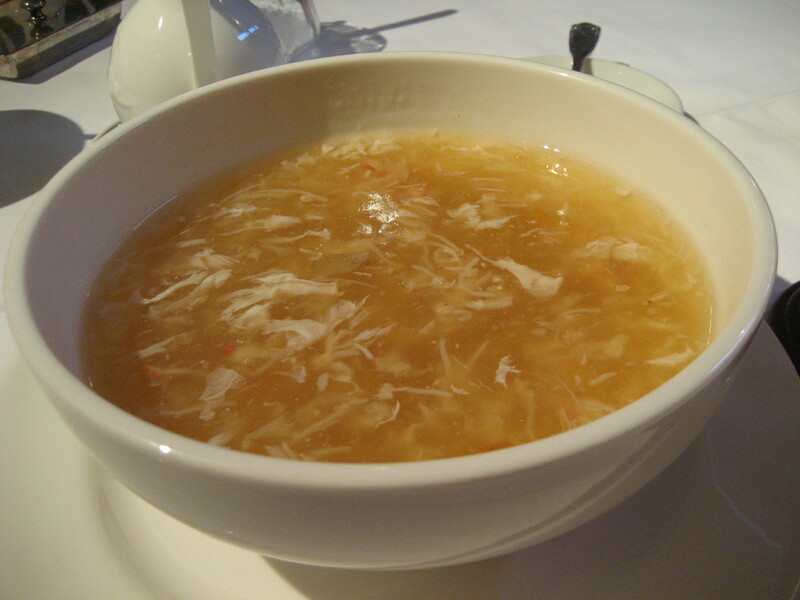 The second course was Shark Fin Soup with Crab. I have eaten shark fin soup before, but always questioned the authenticity of the shark fins. I always thought I was being served cellophane noodles instead. I think I was right as this texture was nothing like the bowls I’ve previously eaten. Slightly chewy, they combined beautifully with the sweetness of the crab meat. This soup may not be humane, but it sure tasted good! 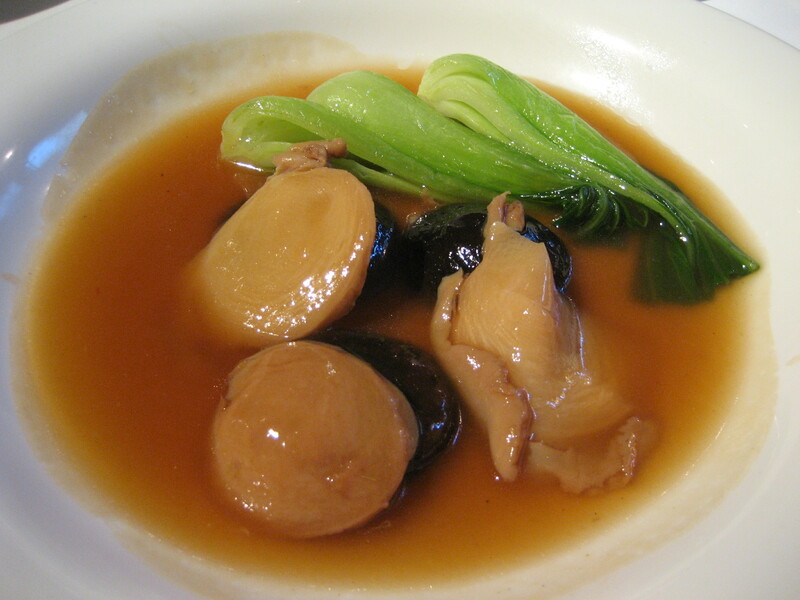 The third course was abalone with Simmered Shiitake and Bok Choy in Oyster Sauce. It’s really too bad that abalone is illegal in the States, it really is a wonderful mollusk. Dense in texture, it matched very well with the soft shiitake and bitter green. The fourth course was Beef with Shimeji Mushrooms, Carrots, and Asparagus. Served in a soy based sauce it was simply wonderful. 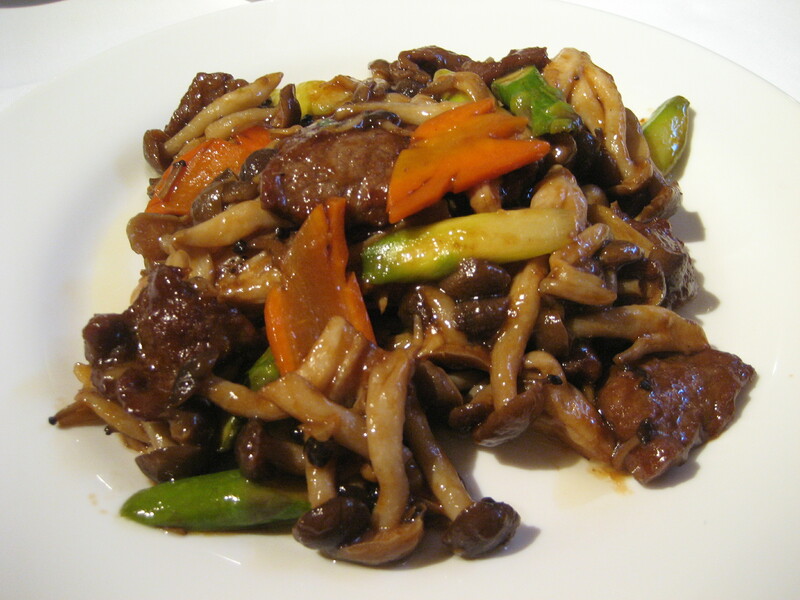 After eating this I don’t see how I can go back to eating Mongolian Beef in Chicago’s Chinatown. 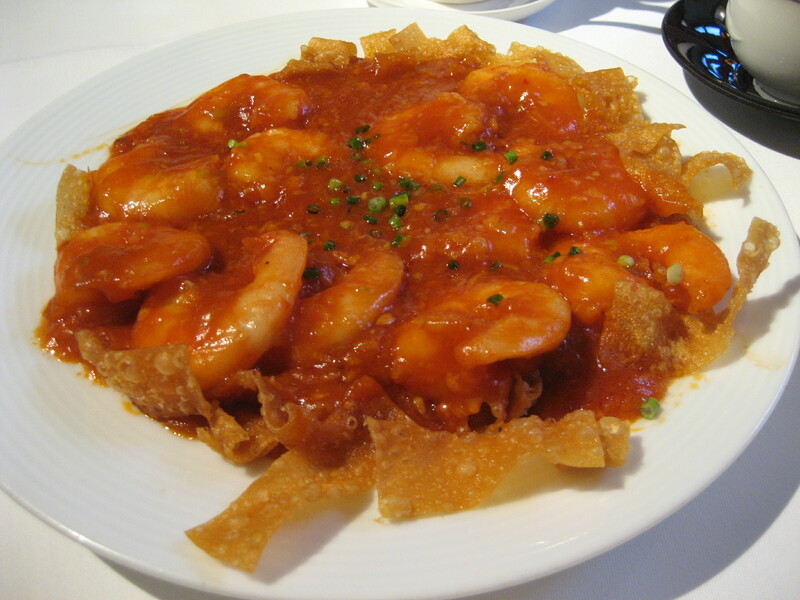 The fifth course was Shrimp in Chili Sauce. A little bit of sweetness and just the right amount of heat to get your mouth tingling a little. The spice made you want to keep coming back for more. Fried wonton skins added some crisp texture and was Uichiro’s favorite part of the dish. The sixth course was Sautéed Rice with Egg, Pork, Green Onion, and Lettuce. 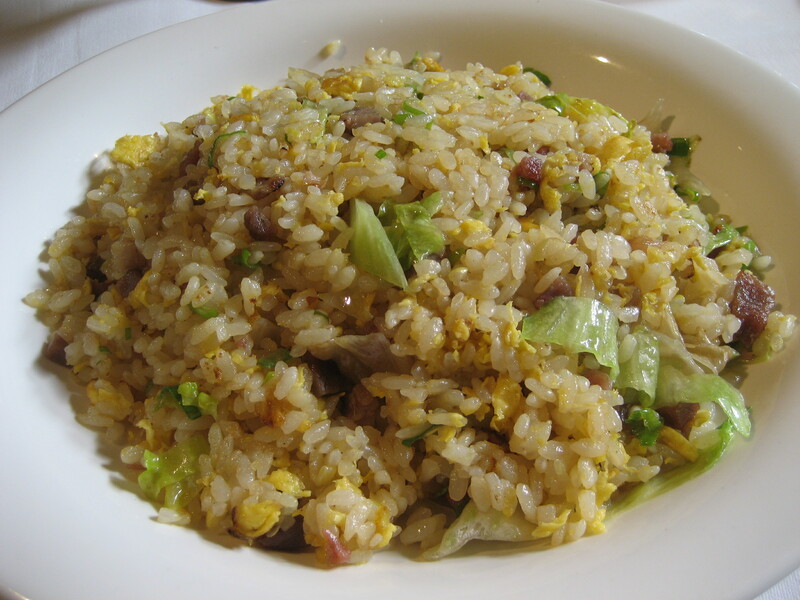 This dish is similar to fried rice except that it’s sautéed together over a lower heat. This keeps the rice a little softer and helps prevent the lettuce from wilting under the intense heat of a hot wok. I’ve seen his dish on Iron Chef and was glad to get the chance to eat such a high quality version of it. 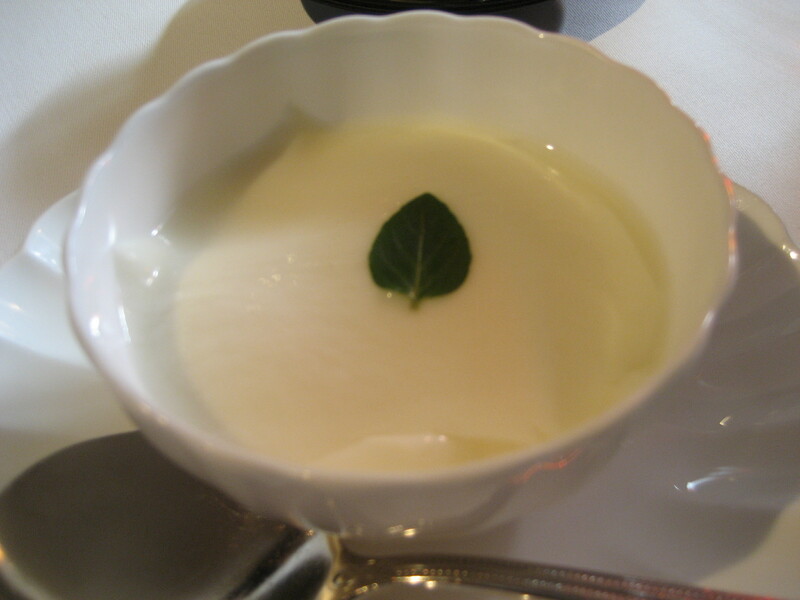 The seventh course, dessert, was Almond Jelly with a sprig of mint. I think this was Uichiro’s favorite part of the whole meal. He’s eaten many different almond jelly’s in his life and couldn’t get over how good this one was. I’ve only eaten a few, but I agree that this one was the best I’ve ever had. Sweet with the texture of a fine silken tofu, a great way to end a great meal. All in all, I will say that none of these dishes were out of the ordinary for Chinese food as far as creativity. However, that said, I don’t think you’ll find better preparation anywhere in the world. In each dish the ingredients were of the highest quality, they were all cooked to perfection, and the flavors were expertly balanced. Hands down the most fantastic Chinese food to ever pass through my tracts! While Xie Huaxian is no longer cooking at HeiChinRou, his successor, Nishizaki-san, is no slouch.